Strawberry Hill House020 8744 1241work Historic HouseStrawberry Hill is Britain's finest example of Georgian Gothic Revival architecture and interior decoration. It began life in 1698 as a modest house, built by the coachmen of the Earl of Bradford. It was transformed into 'a little Gothic castle' by Horace Walpole, man of letters and the son of England's first Prime Minister. Between 1747 and 1792 Walpole doubled its size, creating Gothic rooms and adding towers and battlements in fulfilment of his dream. Further additions were made by the Countess Waldegrave in the 19th Century. Strawberry Hill was already a famous tourist site in its own day. It has miraculously survived into ours, its rural surroundings gone, but its charm undiminished. The plaything of Walpole and his friends, it established a taste for the Gothic: fireplaces and gilded ceilings like medieval tombs and vaults, painted glass with rustic and biblical scenes and heraldry. Walpole was a compulsive collector. His gothic home grew to house a vast, idiosyncratic collection and to reflect his social position and aspirations as an innovator in style. He surrounded himself with antiquities, works of art and curios, especially those with strong historical associations. His library and collection of historical prints were equally impressive. In 1842, at a sale lasting thirty-two days, the contents of the house were scattered to the winds, but many can still be identified. Horace set up a private press at the house, publishing important historical texts and his own writings on history and art, He also wrote the first Gothic novel, set in the house, establishing a form and taste which is still with us. Following an £8.9 million restoration with the support of the Heritage Lottery Fund, the house is now open to the public as an extraordinary fairytale experience. Bookings may be made on the website given below or by telephoning 0208 744 1241. Strawberry Hill is Britain's finest example of Georgian Gothic Revival architecture and interior decoration. It began life in 1698 as a modest house, built by the coachmen of the Earl of Bradford. It was transformed into 'a little Gothic castle' by Horace Walpole, man of letters and the son of England's first Prime Minister. Between 1747 and 1792 Walpole doubled its size, creating Gothic rooms and adding towers and battlements in fulfilment of his dream. Further additions were made by the Countess Waldegrave in the 19th Century. Garden open 10am - 6pm, 7 days a week from 9th January until 22nd December. 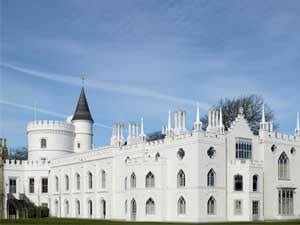 Please note: Strawberry Hill House & Garden sometimes closes for special events. Please check website before visiting to avoid disappointment. 50% off standard adult admission price for National Trust members, National ArtPass holders, long-term disabled and jobseekers. Free for Under 16s, carers accompanying a disabled person and Friends of Strawberry Hill House members. Prices above are for standard self-guided visits. Guided tour tickets are also available - see website..